I love pulled pork, but sometimes I want something a little different. And this got me to thinking about a good old fashioned ham BBQ. I hadn’t had it in a long time so I started looking online at some different recipes and found a chipped ham barbecue recipe that I liked. I then tweaked it according to some of the suggestions left by reviewers. If you are wondering what chipped ham is, it’s just another word for shaved, which they will do for you at your grocery store deli. Frugal Tip: if you want to make this recipe for a large crowd you can save a lot of money by getting a lean, boneless fully cooked ham from the meat department and getting it shaved at the deli. I am not sure if all grocery stores do this but many will. Just make sure you go at a time when the store isn’t too busy because it is time consuming to shave an entire ham. In a saucepan, combine the ketchup, water, mustard, vinegar, Worcestershire sauce, brown sugar, minced onion, salt and pepper. Heat over medium-low heat for about 5 minutes for flavors to blend. Stir in the shaved ham and continue cooking, stirring occasionally until heated through. Serve on hamburger buns and top with sweet pickle relish if desired. Tip: You can serve these on your favorite sandwich buns or smaller rolls for ham barbecue sliders. 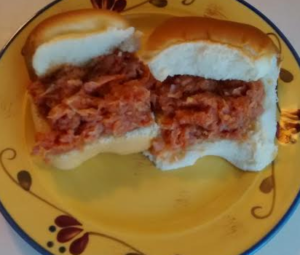 We like the Kings Hawaiian brand rolls for sliders and found a generic version at our local Aldi for half the price. If you want to double or triple this ham BBQ recipe for a picnic or potluck you can easily do it in your slow cooker. Just place all ingredients for the sauce in your crock pot and heat until warmed. Stir in the ham and continue to heat until warmed through. Crock pots vary so how long it takes depends on your crock pot as well as how much ham barbecue you make. Since the ham is fully cooked all you need to do is heat it through. I didn’t double the recipe and it took about 20 minutes on high in my crockpot for the sauce to warm and about another 30 minutes for the ham to warm through. These go great with Red Wine Vinegar Coleslaw and Deviled Egg Macaroni Salad.